I'm incredibly lucky to live in New York City, for so many reasons - but last week, I was particularly lucky. I was scrolling through social media and there was a sponsored advertisement for something special happening in NYC that included this picture. It was one of the most glorious things I'd ever seen (in print.) I immediately forwarded it to a friend, and said, "I must see this in person!" 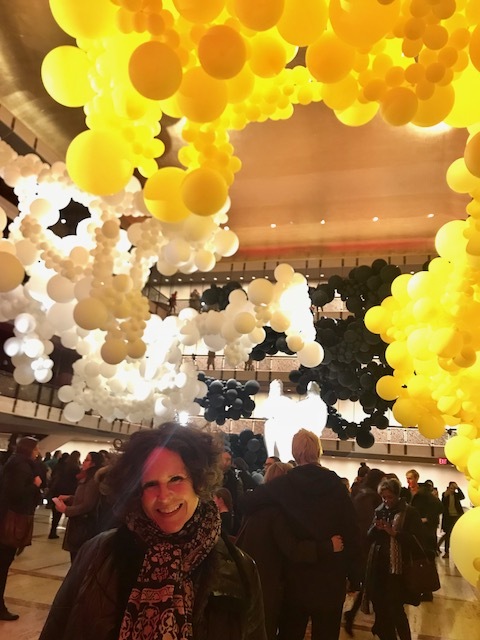 The New York City Ballet puts on an art series, commissioning artists to bring their work to share with the ballet audiences in a pop-up installation during the Winter Series. 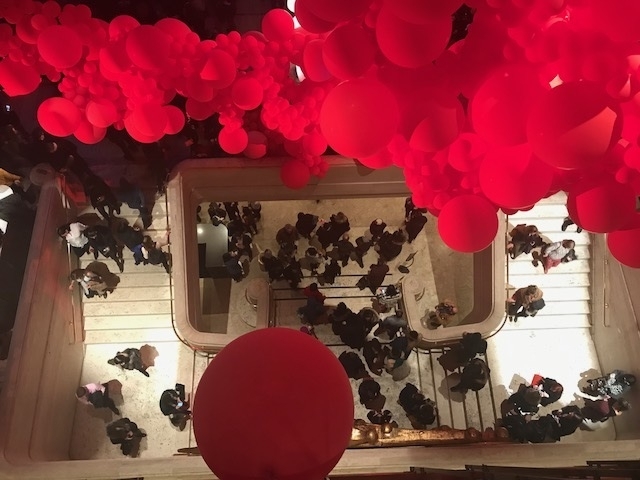 For the 2018 season, the Turkish sculpture artist Jihan Zencirli (aka Geronimo) was invited to create an installation for the lobby of the theatre. I see many art installations. They're kind of my thing - they're interactive, interpretive, experiential, and often times sensual. You're not just looking at a painting and walking away - there might be a sound element, something to touch, smell, or even taste - something to engage your senses and imagination that lasts long after you've moved on to something else. 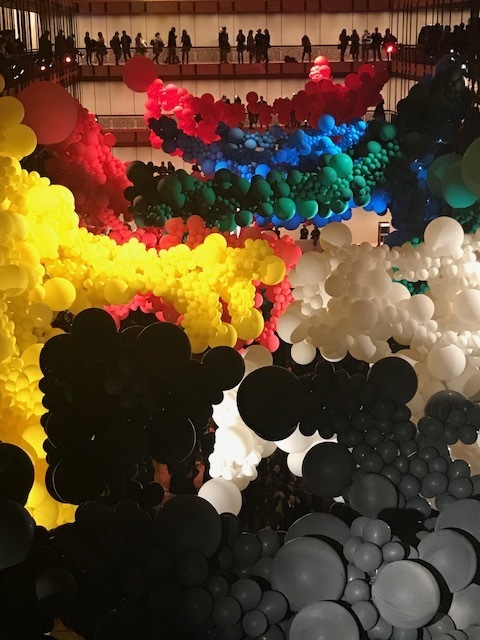 Jihan Zencirli's sculpture medium is balloons! What?! Yes! She believes that part of the magic of her art is that it is fleeting. She explains, "Balloons are not meant to last forever. They vanish." (Her balloons are made from post-consumer waste plastic and latex, which comes from rubber trees and eventually decomposes.) "So," she continues, "rooted in my work is the reminder that you will only have this experience at this particular time. You're here, you're seeing it, you're alive." I read that sentence after watching this incredible promotional video and I became obsessed. I had to be there, see it, and be alive. I researched dates and tickets and invited my friend Paige Davis to accompany me. Paige is a professional dancer, among many other things (look for her return as the host of the TLC award winning show Trading Spaces on April 7th!) and we actually met years ago in a dance class. She would be the perfect date. I sent her the video and knew she would be just as amped to see this as I was. Little did I know, Paige never opened the video or even knew that there was something special accompanying our night at the ballet. She just thought we were going to see some dancing. I greeted Paige in the lobby and knew right away she was having a rough time. I learned that all sorts of balloons in her personal, professional, and emotional life were popping all around her. A week of loss, misunderstanding, and misguided personal attacks from the media had brought her to the ballet that night. She confessed that she wasn't going to be the greatest company that evening. I hugged her and asked if she saw the balloons from outside. What balloons, she asked? Didn't you watch the video? No. You really don't know why we're here? To see the ballet, right? I grabbed her hand and said, "We are going to see something that doesn't last forever. But by seeing it, it will prove that we were alive to witness it." 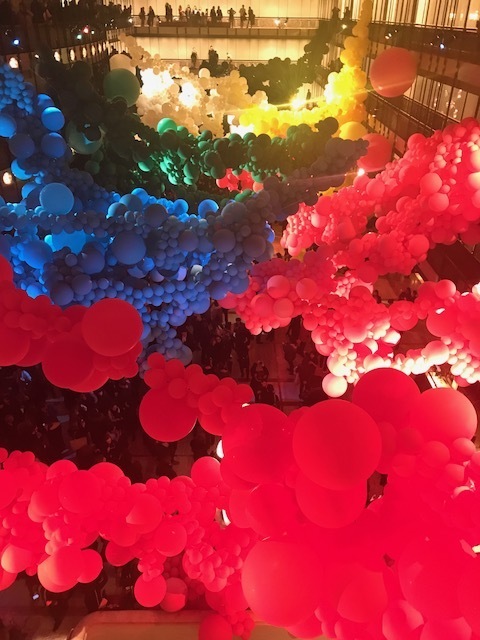 We walked upstairs, entered the hall containing 200,000 balloons, and were blown away. We were 100% alive. The balloons were otherworldly. From every angle it was like we were in some scientific Petri dish of molecules under the glass slide of a microscope. Or like we were in a life-size bowl of gum balls. Or like we were on the surface of another planet. Or like we crashed the prom of aliens. It was so many glorious things. 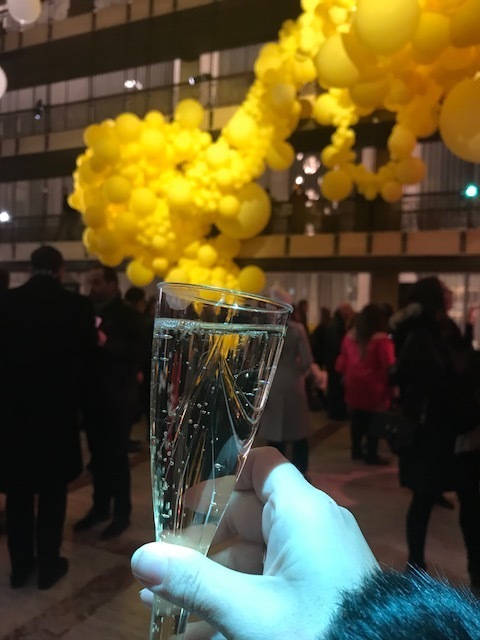 Paige and I sipped bubbly champagne, echoing the bubbles of the balloons, and felt like giddy children snapping photos and looking at the wide - eyed faces of the other ballet patrons. We noticed that some of the balloons had popped. It was evident that there was some balloon shrinkage in many of the clusters. 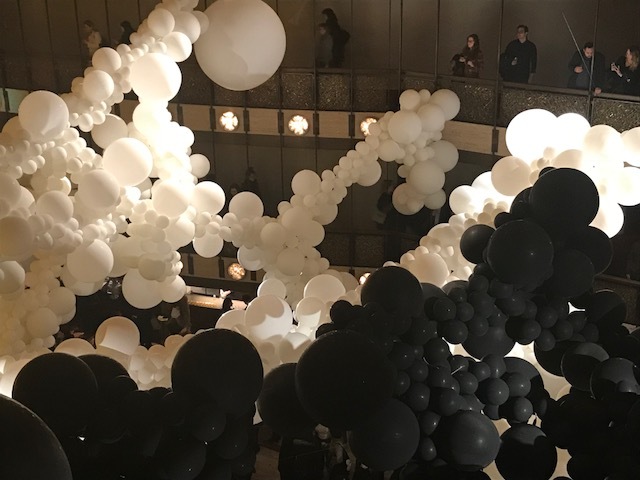 Jihan says, "As the balloons biodegrade, the way they change, that transition from ripe perfection to decomposing fragments is part of their complexity." 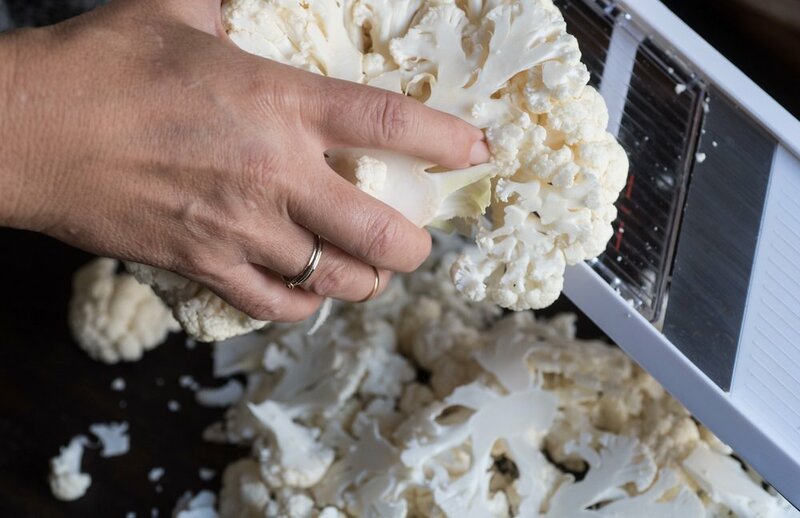 She says, "I'm offering an experience to reconsider the ideal aesthetic and create a taste for imperfection and spontaneous shape-shifting." Aha! Reread that sentence. Put it in your pockets. It's a good one. How often do we cling to the ideal aesthetic? We strive to look a certain way, harshly judging ourselves if we can't attain the ideal. We judge the appearance of others; someone's too skinny, too fat, balding, or they have gorgeous heads of hair, hourglass figures, no cellulite and on and on... Few of us have the 'taste for imperfection.' Many of us want to be ripe and perfect all the time. But there's charm in a chipped tooth and there is character in every strand of silver hair developing on top of our heads. The diversity and uniqueness of all shapes, colors, and sizes is what makes our planet truly stunning. Are we open to change - the spontaneous shape shifting of life? Can we handle things not turning out the way we planned or anticipated? Are we able to see the beauty of a situation even when the balloons of our hopes and dreams pop and disappear? I was talking with my friend Scott (the same money wizard friend from You're Worth It) this weekend whose brother is battling cancer. We spoke about the prognosis. Scott said something so wise. He said life is just a number. "You're either 100% alive or you're dead." A 50/50 chance that a treatment will work or that cancer will go in remission... that doesn't mean anything. We are alive until we're not. So we need to make the absolute most of our time. 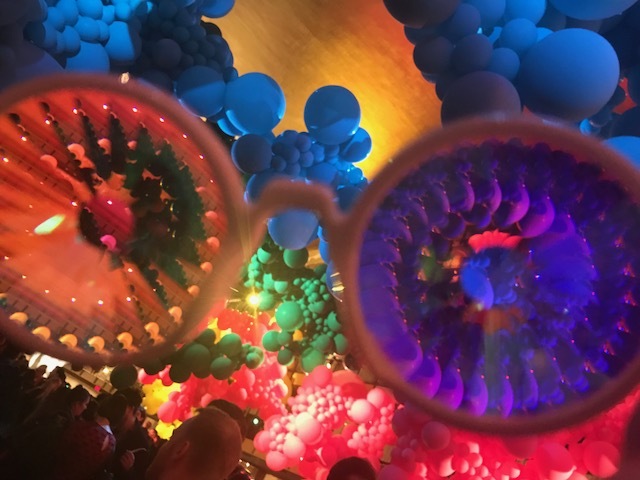 I've been thinking so much about that and how it related to seeing the balloons with Paige. 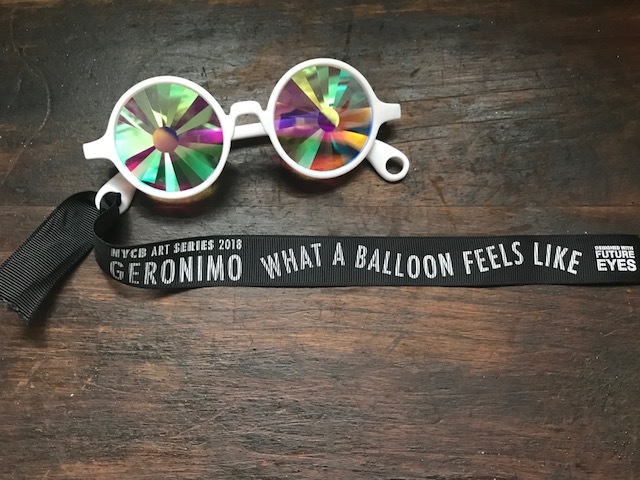 In the spirit of Geronimo, I want to reconsider the ideal aesthetic, develop my taste for imperfection, and welcome the spontaneous shape-shifting of the world around me. I want to be living at 100% capacity while I can. Will you join me? Fantastic events happen all over the world, in your city, in neighboring towns, in far flung places on the map, not just NYC. Seek out something out of the ordinary this week. Something fleeting, but joy bringing. Something that makes you feel 100% alive. Go to the drugstore and buy a package of balloons! Breathe your life into them. Fill them with your good intentions and gratitude, your hopes and dreams for a life well led, fill them with prayers and blessings for the people that you love. This week I'm sharing a recipe that keeps me present and is a huge reminder of the preciousness of life. 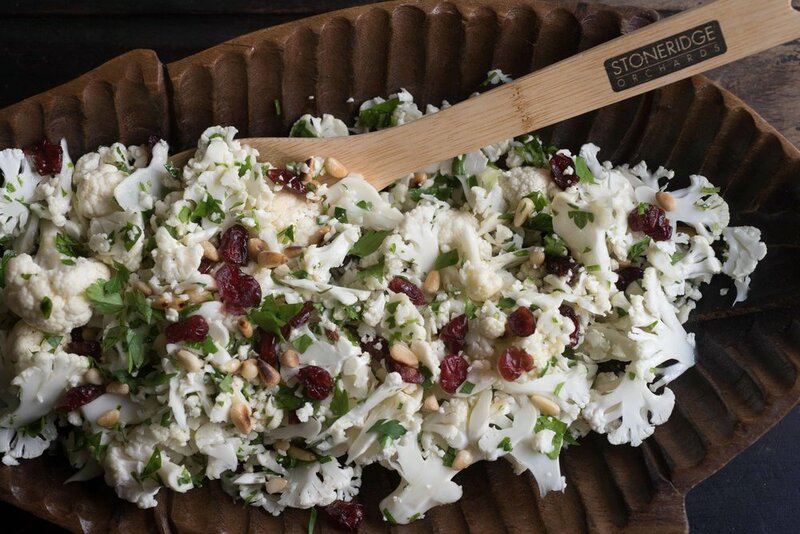 I was on a photo shoot for my beloved Stoneridge Orchards, the dried fruit company for whom I create recipes and content. 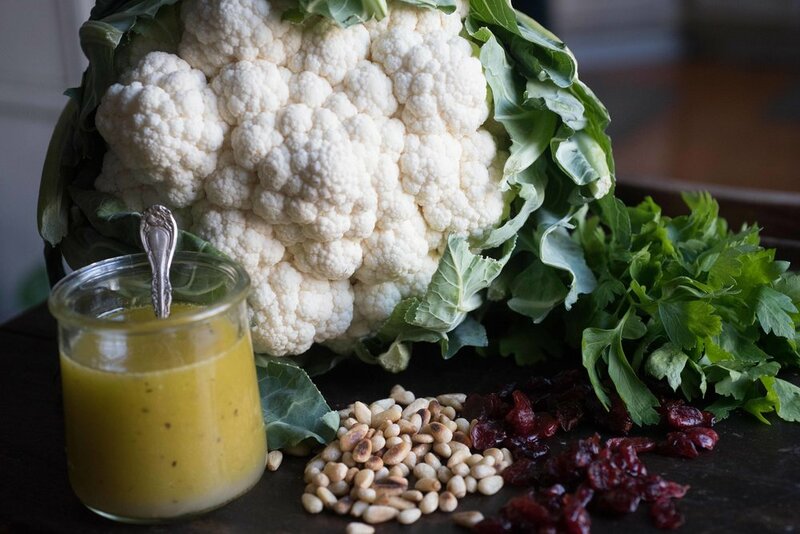 The preparation and photography for this recipe went smoothly, but in the clean up, I ended up at the hospital with a severed artery in my finger. I'll be honest, I still get shivers up and down my spine when I look at these photos. I think reminders of great pain - physical or emotional, are also great reminders that we are living and that we can endure and overcome much more than we think. 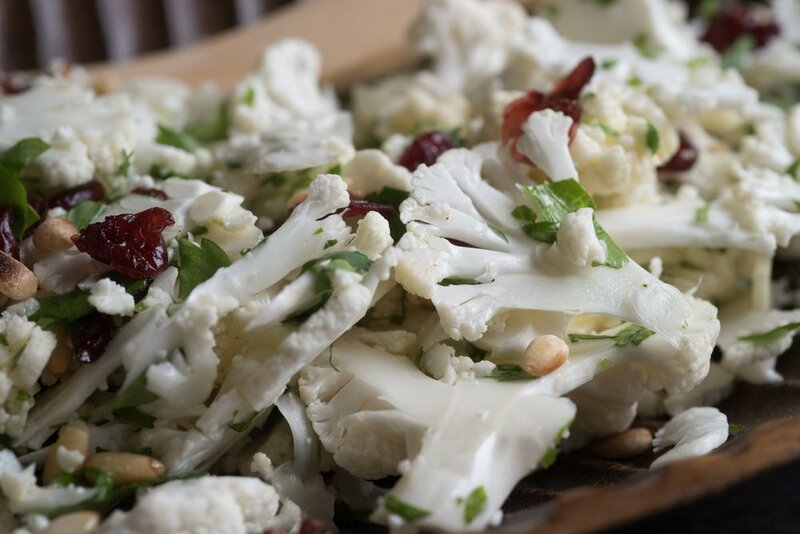 Combine all the salad ingredients together and toss with the dressing.